What Pierre-August Renoir himself titled this painting is unknown, but La Promenade is in part an homage to earlier artists that he greatly admired. Renoir had spent the previous summer painting outdoors with Claude Monet, who encouraged him to move toward a lighter, more luminous palette and to indulge his penchant for luscious, feathery brushwork. Here Renoir retained something of Gustave Courbet's green-and-brown palette while choosing his subject from the sensual, lighthearted garden jaunts of eighteenth-century painters such as Jean-Antoine Watteau and Jean-Honoré Fragonard, whose works he had studied in the Louvre. 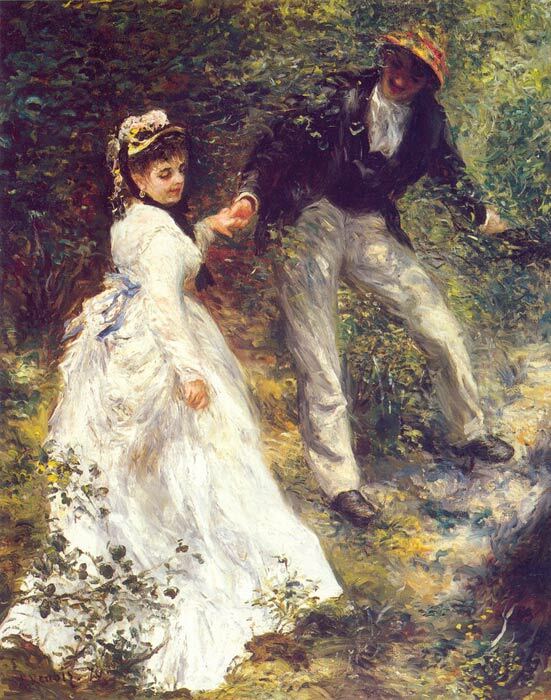 Unlike the images of seduction created by his predecessors, Renoir's is a fleeting moment caught by chance--middle-class Parisians immersed in nature, possibly a local park, not set before a studio backdrop. The dappled light filtering through the foliage would become a trademark of Renoir's finest Impressionist paintings of the 1870s and 1880s. He used a thin, oily paint mix, his glazes here floating into each other to create depth. SPECIAL NOTE : The painter will make the reproduction as close to the original oil painting as possible. If you want your painting to alter from this likeness, please email us and " La Promenade, 1870 " will be reproduced according to your special requirements.